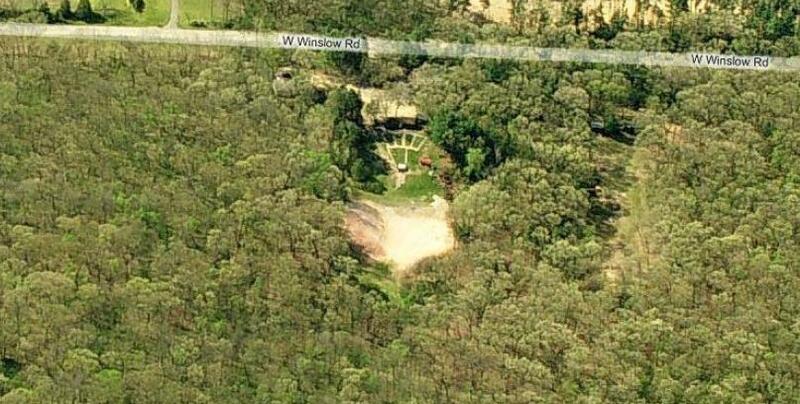 This is the Kepotah trap shooting range, viewed from above. From this perspective, we are looking over the barrels of shotguns, aimed at biodegradable "birds", with the shards falling into the sand pit at center. Barely visible, to the right, is the rifle/pistol range. "THE BIRTH OF A SPORTSMAN'S CLUB"
Kepotah Sportsman's Club was formed because Bud Nelson was humiliated by a Boone County farmer. Nelson ,who had hunted and fished all his life, had observed the deteriorating hunter/­farmer relationship over the years, and at first considered "hanging the old shot gun on the wall". His second thought was "if you can't lick'em, join'em". He decided to organize a group to meet the needs of sportsmen. An early choice of name, "Rockford Rod and Gun Club", reflected the wide range of interests the club would pursue. Unfortunately the name was not available because someone was keeping the corporate charter of the defunct Rockford Gun Club alive, and the State of Illinois said the names were too much alike for a new Corporation to use Rockford Rod and Gun Club. Negotiations by that time were underway to acquire land in Shirland Township, and an old survey map to the land was titled "Kepotah Camp". Nelson challenged the State to come up with the name "kepotah". The State conceded and "Kepotah" would be the name. Kepotah is an Indian word meaning "sweet water" and the Sugar River was once named Kepotah. Shirland Township was first named Kepotah and the name appears on many land documents. A Shirland Township resident, a non-member, has the "kepotah" license plate often seen in the area. Nelson had belonged to an ad hoc group of duck hunters who leased hunting rights on the farm just West and North of Harrison. The arrangement was unsatisfactory since two parties had leased grazing rights and assumed they, their families and friends could hunt there as well. Also, boys who had grown up hunting the Sugar and Pecatonica bottoms saw no reason to stop because some city slickers had leased some hunting rights. Nelson had in mind a more structured, permanent organization. After making his plans he first discussed his idea in September 1953 with a duck-hunting buddy, AI Hermanson. Hermanson was a member of the rights-leasing group and endorsed the idea enthusiastically. Nelson then enlisted his hunting-fishing-golfing partner Ace Pirrello. The three then talked to friends, co-workers and family members and the members and the number swelled to twenty-four, a majority of whom had hunted or fished with Bud Nelson in the past. Nelson, Hermanson and Pirrello decided that twenty-five was a good cut-off point. Each one came up with one more member, and the magic number was changed to­ twenty-seven. One of the final three was Don Bergstadt, who went on to establish an unparalleled record of service to the club. Serving in office for nearly thirty years and performing many other club tasks and duties throughout our clubs history. If Bud is the "Father" of Kepotah, surely Don Bergstadt is its "Mother". The first meeting of Kepotah was held at the home of Selwyn "Sully" Johns in Rockford. About 14 of the 27 enlistees showed up. 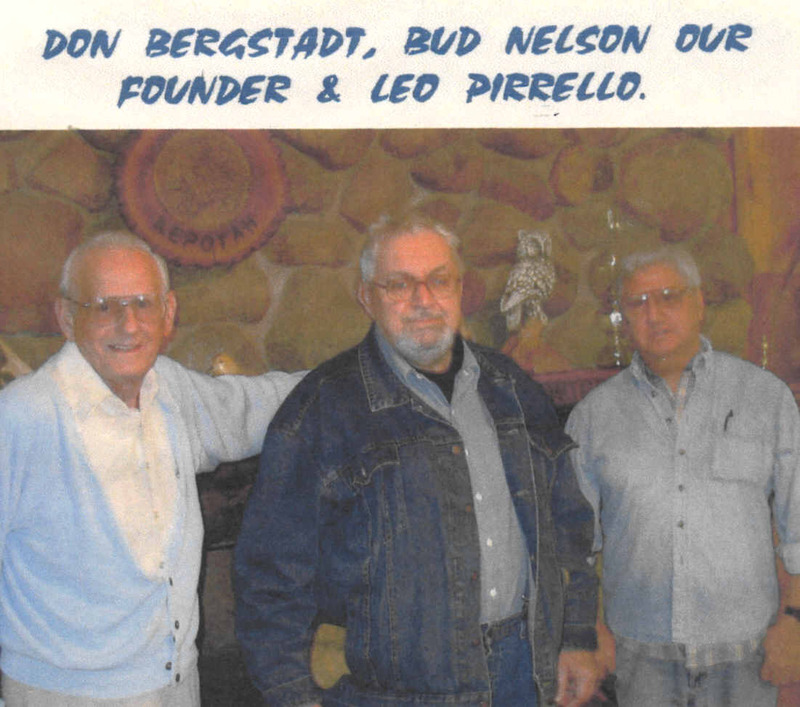 Bud Nelson was elected President, Al Hermanson Vice President, Ace Pirrello Treasurer and Bob Kuebler Secretary. The practice of meeting at members homes was continued until the property was purchased. 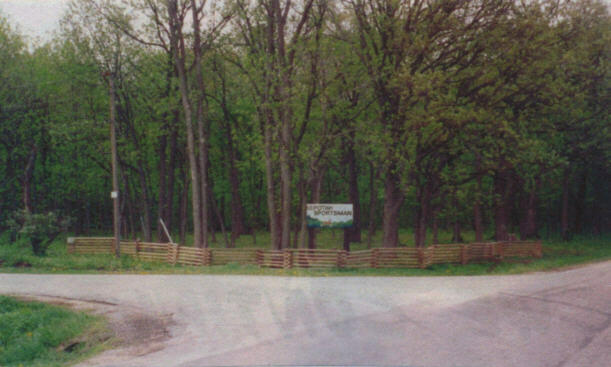 Nelson wanted the members to share his love for Kepotah woods, and early meetings were held in the open on the bluff overlooking the river, about where the picnic screen shelter now stands. The search for suitable property extended from the old duck-hunting property outside Harrison to the Wisconsin State line. One day in the dead of winter 1953-1954, Bud Nelson, Bert Carlson and Howard Reynolds, a Shirland resident who would later become a member, walked down the frozen surface of the Sugar river from the North and when they came around a bend and saw the woods of Kepotah rising before them, they knew they had found a home. There were no structures on the property. The land was gashed by two huge excavations from wartime sand-pit operations. (These later became the rifle range and the trap range.) Nelson saw the potential of the property and he and Hennan Rupp negotiated with the owner to buy the land on both sides of the river for the staggering sum of $7888. 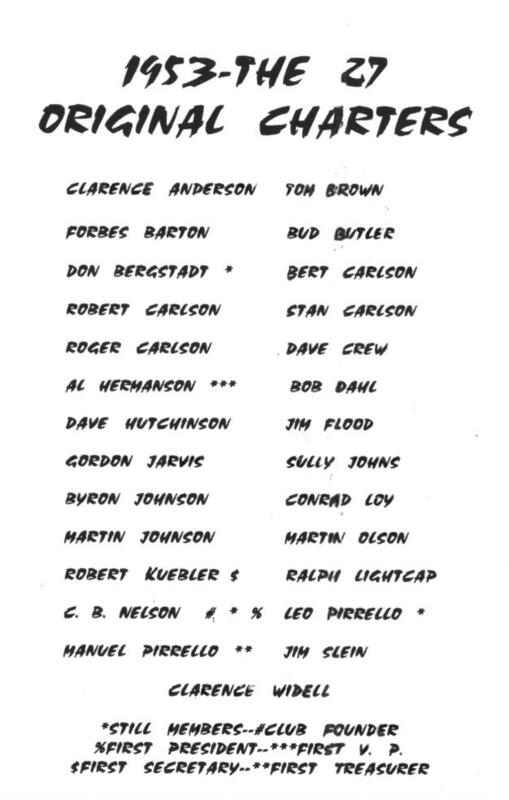 At this writing (January 1998) only three of the original twenty-seven members remain in the club: Bud Nelson, Don Bergstadt, and Leo Pirrello (now life members). Of the original twenty-seven, some never attended a meeting, and several dropped out fairly early. Their places were taken by others eager to participate in Kepotah's growing programs. One precept has remained from September 1953 to today, and that is that every member of Kepotah is there because another member wanted him to be admitted strongly enough to sponsor him. Bud Nelson is the only member who can't make that statement! Wild flowers, mushrooms, herbs take root. Then slowly, slowly fades away. The glen a solemn secret holds. Proclaim another soul at rest. Of flowers, mushrooms, herbs and trees. The echo of the words will cease. The shadow of the overhead sign casts onto the entrance drive before sunset. 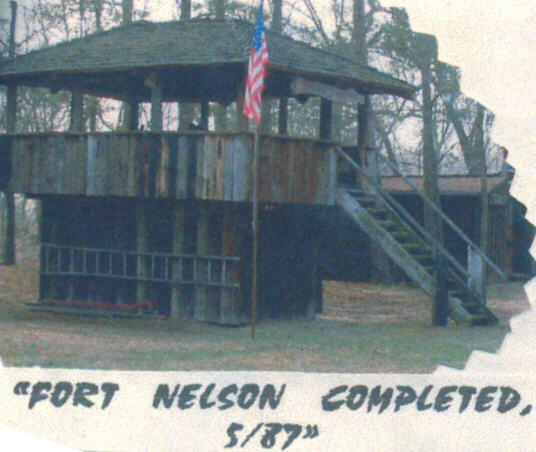 "Fort Nelson" an observation deck, standing on salvaged telephone poles. The pictures above are excerpted from Don's 40th & 50th anniversary history and photo compilations titled "The History of Kepotah.